What is my Parkinson’s coaching? A Parkinson’s coach should be a person who has learned what he is coaching from experiencing Parkinson’s Disease first hand. He has stood in Parkinson’s shoes, has suffered with the disease, has faced the fears of the disease, has fought the disease, and has defeated the disease and recovered from Parkinson’s. 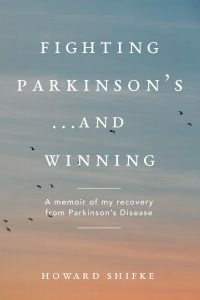 I fought Parkinson’s Disease and I prevailed. I am symptom free and have been since June 12, 2010. This has been confirmed twice by my neurologist. On my website, I have provided my complete Parkinson’s Recipe for Recovery®, recounting what I did to recover from Parkinson’s. This has been provided at no cost. If you read the Testimonials section of this web site, and if you read the comments being posted on the blog, you can see how others are doing as a result of being coached by me, that is, having learned the Recipe by me explaining the Recipe and demonstrating it. If you decide to do the Recipe and Parkinson’s Coaching, I am not representing that your results will be the same as mine or theirs. Nobody can make such a representation. My Parkinson’s Coaching: Going over the Recipe, step by step. I am able to explain each part of the Recipe in detail, and for those of you who are on Skype or FaceTime, I can demonstrate the physical exercises in the Recipe. Essentially, I can tell you and show you what I did for my recovery. Unlimited email communication with 24-hour or less response time. The cost for the Parkinson’s Coaching Package is $500. If you are ready to purchase the Parkinson’s Coaching Package, please click BUY NOW and proceed with the transaction. If you would prefer to communicate with me prior to purchasing the Parkinson’s Coaching Package, I will provide you with a 30-minute conference by phone, Skype, or FaceTime (or in person if local) at no charge. Send me an email at howard@fightingparkinsonsdrugfree.com and I will coordinate the conference with you. (If you decide to purchase the Parkinson’s Coaching Package without first having the 30-minute complimentary conference, the 30-minute complimentary conference will be added to your Parkinson’s Coaching Package).